NEWPORT HARBOR — The California Coastal Commission approved plans to construct a 23-slip marina, 23,000-square-foot community and sailing center and a waterfront park on 10 acres of bayfront along Newport Harbor’s Balboa Peninsula. The commission’s unanimous approval of the project at its June 13 meeting signified the clearing of a large regulatory hurdle for Marina Park, which has been in the works for nearly a decade. 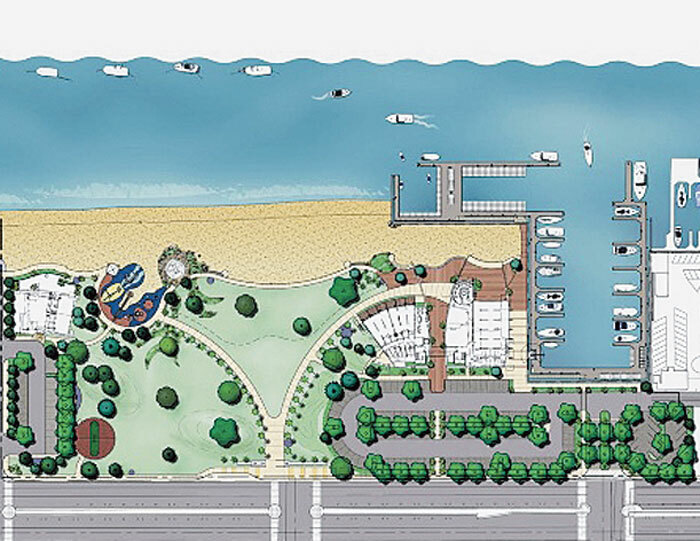 Located between 15th and 19th streets along Newport Harbor’s Balboa Peninsula, Marina Park’s design plans show a 23,832-square-foot multipurpose community and sailing program building, a 23-slip marina and 200-foot side-tie area; park amenities, including basketball half-courts, a children’s play area and new restrooms; greater accessibility to a large public bayfront beach; a new 5,500-square-foot Girl Scout building; and a 157-space parking lot. Designed by Rabbe/Herman, along with Bundy-Finkel Architects, Marina Park is estimated to cost between $20 and $28 million, depending on final design characteristics. It will replace a 57-unit mobile home park that is currently on the site. Residents of the 50-year-old mobile home park will be given a 90-day notice to vacate the premises as soon as a construction date is posted, which Newport Beach deputy Public Works director Dave Webb indicated should begin in January 2013. Approximately 52 residents located on the site entered into a settlement agreement with the city in 2007, with the city paying for $35,000 for each unit and slightly lowering the rent for the remainder of the residents’ stay on the property. While the commission approved the plans for the site, a few conditions were discussed on the building height and the area’s landscaping, including a limitation on the height of the community center’s 71-foot faux lighthouse that was to act as the building’s identifying characteristic. The current height restrictions are set at 35 feet for Newport Beach’s Balboa Peninsula. The commission deadlocked on a motion to allow the structure to impede the height variance, which ultimately defeated the amendment, leaving the height at 35 feet. Commissioners also discussed Marina Park’s plans to reuse and resituate the property’s existing palm trees (non-native species) on the future property, and ultimately allowed for the trees to stay. The 23-slip marina will include 21 slips for boats up to 40-feet in length and two slips for boats up to 57 feet in length. The 200-foot side-tie area is planned to be used as a public transient vessel dock, with recreational vessels, and sailing center docks and boats. Around 68,000 cubic yards of sediment will be dredged from the area. The plans call for 53,000 cubic yards of sediment to be sent to an approved offshore disposal site, while 15,000 cubic yards of sand will be used to replenish beaches.